For use in fountains, ponds and water features. Limited 90 day Warranty. Visit angelodecor.com for more information. Hampton Bay 3 Pc Solar LED Spotlight Set allows spotlights to be added in areas where wiring does not exist. Place remote high-efficiency solar panel in full sun and place 3 spotlights where needed to highlight your landscape features. Hampton Bay 4 Pack Solar LED Square Walk Light Set is a sleek addition to your pathway with its square shaped design. Diamond cut glass lens provides a dramatic lighting effect. Bright 2.4 lumen output. Add style and enhance the beauty of your home and garden with this solar garden light. Black finish for universal appeal adding charm and safety to your home and pathways or gardens. Solar can be positioned anywhere the sun shines just staking into the ground with the included parts. This powerful, versatile Low-Voltage LED landscape light from Hampton Bay has an adjustable head so that it can be used as a path light or wall wash light. The powder-coated bronze finish makes this landscape light durable in all weather conditions and has a no rust guarantee. This LED landscape light boasts 120 Lumens to brighten any spot where it is installed. This low-voltage landscape light is compatible with 12-Volt lighting systems and will create just the lighting accent you're looking for. 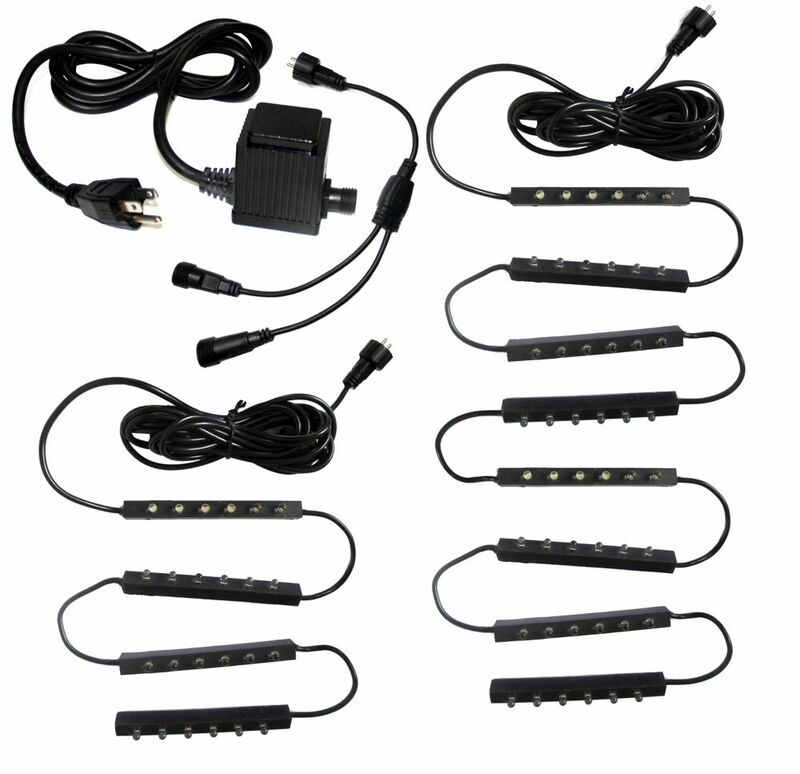 72-Light Water Feature LED Set For use in fountains, ponds and water features. 72-Light Water Feature LED Set is rated 2.9 out of 5 by 7. Rated 3 out of 5 by Mjkelch from four of the LEDs have stoppeD working Have been running these lights for a month now. They look nice but four of the led’s have stopped working so now it’s a 68-light set. Hopefully the rest of them will remain functional. Rated 4 out of 5 by Sup999 from Looks good but incomplete Fountain looks great with these but they only light up the 2 bottom sections. The set-up looks incomplete without the 24-LED light set we had to purchase separately. May as well have it all in one. Rated 5 out of 5 by Doorman from Great set of lights ( 3 tier fountain) Had these for over a month now and they look great! Very bright and have had lots of compliments! Rated 1 out of 5 by JimInKingston from Do not buy Purchased this product for my backyard pond in the summer and they looked very nice for a few weeks then began to burn out. Of the 72 lights I now have 11 working lights and don't expect them to last much longer. Rated 1 out of 5 by Bapp from 72 Led light set fountain set Angelo Decor I thought I had the perfect solution for my fountain Looked good, easy to install, worked well and was bright enough. Maybe could be brighter. Two weeks later many of the individual led lights are out and will be returning product to home depot as soon as I can remove from fountain.